Lovely idea.....I would love to win this item. It would be nice to have the pattern too.....I could knot some for charity. These look great Jak, People always think that living in Spain it is always warm but it isn,t, admittedely, not as cold as UK. Anyway I am suffering with arthritis in my top thump joint and have been wearing a bandage as it seems to help, these would look great over it. Thanks for the chance. 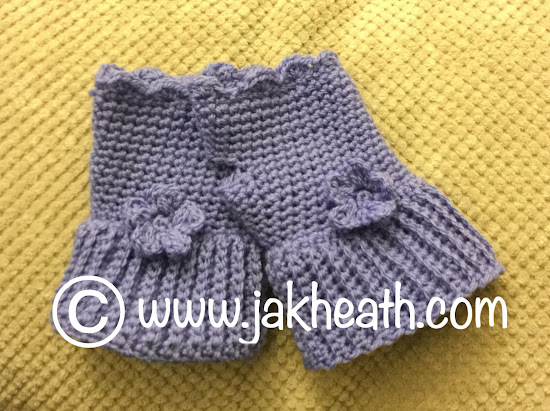 Jak,these look so good,would be great in our very cold winter weather,which is just around the corner!Thank you for the chance ! Hi Jak, brilliant idea, I suffer with arthritis in my hands, these would be ideal. Clever lady. Would love to win the wrist warmers. Would love a chance to win them. Even better, would you share the instructions on your Blog? Just love looking and seeing what you are making. Thanks again. I would love to win your pretty wrist warmers as my hands are so very cold all the time & my knuckle joints get very painful at times 'The Joys of Growing Old'. I LOVE these! So pretty and functional. The colour is beautiful, who wouldn't want them! Oh they are just gorgeous Jack! I was wondering the other day if I needed to wear something like this to help my hands. At the end of the day, especially if it's been very cold, my hands and fingers are so painful. Thank you for giving us the opportunity to win them! These are so pretty and practical too. My daughter works in a unheated warehouse shop, and these would certainly help to keep her warm .